She just couldn't see a kid go hungry. Della Curry, a cafeteria worker in an elementary school in a Denver suburb, has been fired for giving free food to students who didn't qualify for the federal free lunch program. 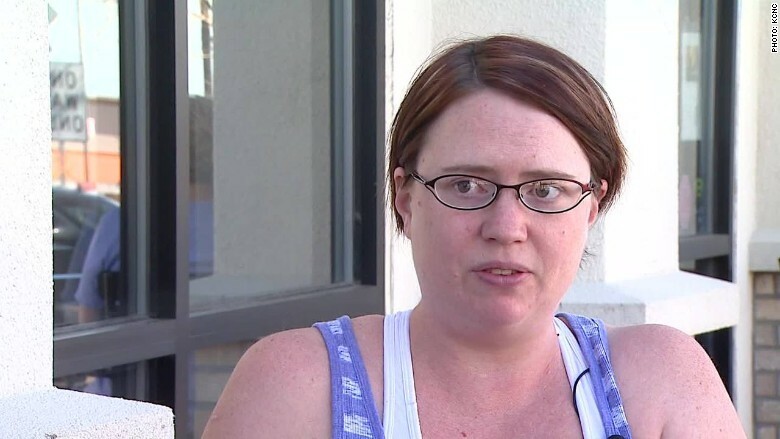 The mother of two admitted to KCNC-TV, which first reported the story, that she violated school policy by giving the free meals but said that she didn't want to see the children go hungry. She's hoping her case will change district policy. "I had a first grader in front of me, crying, because she doesn't have enough money for lunch. Yes, I gave her lunch," Curry told the station. "I'll own that I broke the law. The law needs to be changed." Curry (pictured above) said that many students' families can't afford to send them lunch even if they don't qualify for the free or reduced cost lunch program. She said sometimes students simply forget their lunch money and noted that on occasion she even went into her own pocket to pay for lunches. Cherry Creek School District, where she had been employed, refused to comment to the station about her case, saying it was a personnel matter. But after the report aired, the district posted a statement on the district web site about the policy without mentioning her by name. It said that students are given free lunches the first three times they forget their lunch money and after that they are given a cheese or if available turkey sandwich, along with a milk. "No child is ever allowed to go without lunch," said the district's statement. But Curry said that meal is not enough and leaves kids still hungry. The district said the cost of the district's lunch program are not covered by the prices charged. Curry hopes to speak to the Board of Education about her case and about changing the policy. She may have support from some parents at the meeting. Parent Darnell Hill told the station that Curry should be thanked for what she did. "Do something different than fire her. She's trying to help," he said.